Angry residents of Dubai’s Discovery Gardens are set to take their row to the Ruler’s Court this week in a bid to force developer Nakheel into slashing “exorbitant” service charge fees. More than 90 tenants and homeowners have signed a petition, set to be presented to the Ruler’s Court and Dubai’s Real Estate Regulatory Authority (RERA) later this week, which asks the government to force Nakheel back to the negotiating table to review the charges, which cover building maintenance, community and cooling fees. Residents are due to pay the first installment of next year’s fees on October 1.
fraudulently “misappropriated approximately $10 billion”. A spokesman for Al Sanea’s Saad Group, which is estimated to hold assets worth $30 billion, said Friday that the Saudi billionaire is unaware of the lawsuit. “If we are served with such a claim, we will respond to it vigorously,” said the spokesman for Saad Group, the conglomerate controlled by Al-Sanea, in an emailed statement to Zawya Dow Jones. The case will add to concern about Saad Groupand Ahmed Hamad Al Gosaibi & Brothers Co, or AHAB,as they struggle to restructure their debts after details of financial difficulties at both companies emerged in May. The Gosaibi family, which controls stakes in Saudi American Bankas well as other interests in shipping and industry in the kingdom, has confessed to possible losses at their Bahraini banking unit. Al Sanea, who owns a stake in HSBC HoldingsPLC, faces cash flow problems. 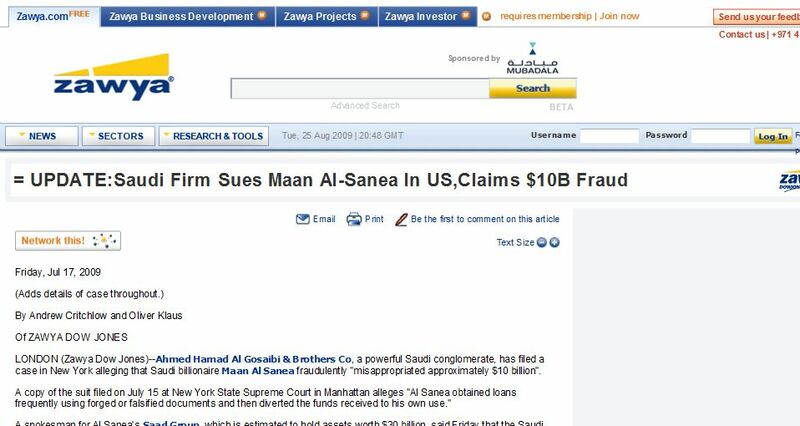 AHAB filed the suit against Al-SaneaAlin response to a case filed in May by United Arab Emirates Dubai-based lender Mashreqbank(MASQ.DFM) over $150 million that the bank alleges it’s owed by the conglomerate. Both families are linked by marriage and have close links with Saudi Arabia’s ruling establishment, making the case a highly sensitive issue in the conservative kingdom. Nakheel is asking investors using credit transfers for property purchases to top up their payments with cash, as it seeks to raise funds ahead of a mid-December due date for a Dh3.5 billion (US$953 million) bond. According to brokers, the Dubai Government-controlled developer allows investors in delayed projects to sell their downpayments to other investors who have already invested in other Nakheel developments. But now the company is no longer allowing customers to use credit transfers alone to fund instalments, and is demanding that part of the payments are made in cash, brokers say. “For example, when a buyer has Dh1m to pay, Nakheel would say you need to pay 30 per cent in cash, which makes Dh300,000,” said one broker, Farid Ahmad Hussein. Nakheel needs to pay back a Dh3.5bn bond on December 14, in what is being seen by international lenders and rating agencies as a litmus test of the Dubai Government’s willingness to support its affiliated companies facing financial difficulties. So called “credit consolidations” were triggered by the collapse in property prices last autumn, which saw scores of developments either cancelled or delayed and effectively ended the “off-plan” property market. Investors in stalled projects have been able to sell their downpayments, usually at a loss, to other customers of the same developer, and then those downpayments can be used on continuing projects. These credits can only be transferred between buyers that have already made downpayments and are not available on the secondary market. Developers facilitate the transfer of credit between investors in different projects to generate funds needed to complete some developments, while also making it easier for them to abandon others. External brokers help to match buyers. Unlike other developers, Nakheel requires the transfer of ownership between investors to be completed before credit is moved between properties. “Investors in projects that have been deferred have the option of consolidation if they own other properties within the Nakheel portfolio. The advantage to the investor is that Nakheel is able to hand over property to the owner sooner than it might on a deferred project and help investors reduce their financial exposure,” Nakheel said in a statement. The developer declined to comment on whether cash payments were also required to complete property consolidations. Nakheel has shortened the time it takes to complete such transactions to about a month, from three or four months previously, according to brokers. Nakheel, the developer of The Palm Dubai, has spent billions of dirhams on projects that are still under construction, while adding further offshore island developments including The World and The Universe. But development on such a massive scale has come at a high price for the company, which is now struggling to repay debts accumulated during the six-year building boom. The trade in credit notes on stalled projects is helping revive activity in the property sector, according to Rajesh Sony, a director of Bluechip Real Estate. The firm, he said, generates 90 per cent of its turnover from matching buyers and sellers of credits. “This is a win-win situation between the developer and investors. If all the investors of one project transfer the money elsewhere, the developer may call off the project without having to refund the money to investors. At the same time, investors can get out of the market without losing all the money, and other investors in ongoing projects can pay their instalments at a cheaper rate,” he said. The exchange of Nakheel credit, or consolidations, began in February on projects that include the Dh4.4bn Dubai Promenade, and the Dh2.9bn Trump Tower, the centrepiece of Dubai’s original Palm Island development, according to Mohammad Mujtaba Vakil, a broker from Linkage Real Estate. He said that while cash components were not requested on earlier transfers, Nakheel now “would not accept anything less than 30 per cent”. DUBAI, United Arab Emirates — Herve Jaubert, a French spy who left espionage to make leisure submarines for the wealthy, was riding high. Bankrolled by Dubai World, a government-owned conglomerate, he built a submarine workshop on the Persian Gulf, lived rent-free in a villa with a pool and tooled around town in a red Lamborghini. He had two Hummers. He vacationed with local plutocrats. Today, the former intelligence operative, who fled Dubai last summer in a rubber dinghy, is a wanted man. In June, a Dubai court convicted him in absentia on charges of embezzling $3.8 million and handed down a five-year sentence, plus a big fine. Jaubert, speaking recently at his new home near West Palm Beach, Fla., said he stole nothing and vowed never to set foot in Dubai again. He said he fled because of gruesome threats by interrogators to stick needles up his nose and what he described as constantly shifting, and all bogus, accusations relating to bullets, murder and the finances of Dubai World’s now-defunct luxury submarine subsidiary. “If I hadn’t escaped, I’d be in the same hell as everyone else,” said Jaubert, one of scores of expatriate business people in this gleaming city-state who have been accused of crimes — and, in some cases, jailed for long periods without being charged. Jaubert’s troubles began two years ago when Dubai’s then-booming economy was showing the first faint signs of strain. Local stock and property prices have since swooned, and the tempo of arrests for alleged business misdeeds ranging from a dud check — a criminal offense here — to serious fraud has picked up sharply. Dubai’s government declined to comment on Jaubert’s allegations of mistreatment. But it has targeted what it sees as dodgy dealmakers and deadbeat debtors, and has declared “no tolerance” of “anybody who makes illegal profits.” For many expatriates, however, the crackdown smacks of a hunt for foreign culprits to blame for the sheikdom’s sliding economic fortunes. A haven of stability in a region of tumult, Dubai is usually a place people flee to, not from. Foreigners, lured by what President Obama in a June speech in Cairo hailed as the “astonishing progress” of this autocratic but vibrant Persian Gulf metropolis, account for more than 90 percent of the population, and 99 percent of private-sector workers. But a severe economic slump has reversed the flow. Those who came to Dubai seeking fortunes in property, banking and luxury goodies for the rich now face a less alluring prospect — a prison cell or furtive flight. Only a tiny minority has been picked up by police but, says a longtime foreign resident who runs a company here, “It’s all a bit scary. They are looking for people to carry the can.” The foreign resident, who requested anonymity in order to speak freely, said a British neighbor was picked up last year. The turbulence is a blow to a place that promoted itself as the Middle East’s answer to Hong Kong or Singapore. It is also a setback for Washington, which has for years touted Dubai as a model of a modern, prosperous Muslim land that, though far from democratic, seemed anchored in the rule of law and committed to basic rights. Among those who have been locked up are a JPMorgan investment banker; American, British and other foreign property developers; a German yachtmaker; and two Australians who worked as senior executives of what was to be the world’s largest waterfront development. 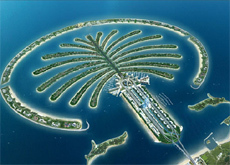 The gigantic project had been launched by Nakheel, the crisis-battered property arm of Dubai World and builder of Dubai’s signature palm-tree-shaped resort islands. A few have been convicted, mostly for bouncing checks. Those still awaiting trial often waited many months in jail before being charged: The two Australians, for instance, were arrested in January, held in solitary confinement for seven weeks and then finally charged, with fraud-related offences, last month, said their Melbourne lawyer, Martin Amad. A banker who headed JPMorgan’s Dubai office and its Islamic banking business was first jailed in June last year but was charged, also in connection with fraud, only this spring. JPMorgan said the alleged crimes do not relate to his work at the bank, which he joined in 2007 and quit in April this year while in detention. The French Consulate in Dubai, which is the business, business and tourism hub of the United Arab Emirates, said it could not comment. France in May opened a naval facility in Dubai’s sister sheikhdom, Abu Dhabi, the UAE capital. Western diplomatic missions have mostly avoided public criticism of the legal system. Dubai is still far more free and more predictable than most of its neighbors, but a chill has taken hold as property values tumble, jobs vanish and businessmen are detained. Tensions long masked by prosperity have burst into full view — tensions between a foreign majority and locals, known as Emirati; between a city studded with shiny modern skyscrapers, including the world’s tallest now in the final stages of construction; and Dubai’s antiquated political and legal foundations. Washington counts the UAE as one of its best friends in the region. U.S. warships dock at Jebel Ali, a huge Dubai port area where Jaubert had his luxury submarine venture, Exomos, which promised rich clients “the ultimate underwater experience.” Big U.S. companies, including General Electric, Boeing and Microsoft, have their regional headquarters in Dubai, which has around 20,000 American residents. These intimate relations include a deal that will allow the UAE to develop a nuclear-power program with U.S. know-how. The relationship came under scrutiny in Washington this year after the release of videos that showed a member of Abu Dhabi’s ruling family torturing an Afghan grain dealer he accused of cheating him. Abu Dhabi authorities are investigating. The number of expatriates jailed in Dubai for alleged economic crimes is not known. The government issues no figures. “All I can say is that it is definitely on the rise,” said Samer Muscati, a lawyer with New York-based Human Rights Watch. The main concern, Muscati said, is not that all those arrested are necessarily innocent but that Dubai’s legal system is so opaque, fickle and often heedless of due process. A vivid example of this is the plight of Zack Shahin, an American businessman of Lebanese origin. A former Pepsi-Cola executive who headed a Dubai property company called Deyaar Development, he was arrested in March last year in connection with a corruption probe involving the Dubai Islamic Bank. Shahin was held incommunicado for 16 days and was not charged for over a year. A Web site set up by his family in the United States alleged that Shahin had been tortured, and it pleaded for his release. The UAE blocked the Web site. U.S. diplomats asked that the case be handled in “an expeditious and transparent manner,” and complained that a delay in granting access to Shahin violated the Vienna Convention on Consular Relations. Early this summer, it looked as if Shahin might finally get his day in court and be allowed to go home to await trial. His family took out an ad praising Sheik Mohammed bin Rashid al Maktoum, Dubai’s ruler, took down the Web site, and scratched together $1.1 million to meet bail. Just as Shahin was about to be released, state security officers arrived and hauled him away for questioning on new charges. He is still in detention. The bail money has not been returned, his lawyers said. Dubai officials said no one was available to comment on the case. Locals have been picked up, too, and some complain of being unjustly detained. But well-connected Emirati rarely spend long in jail for economic crimes. Wary of debtors’ prison, a growing number of foreigners simply run away. Simon Ford, a British entrepreneur, skipped town this summer after his company, a specialty gift service, was hit by the crisis and couldn’t pay its bills. He wrote an emotional “letter to the Dubai public” to apologize for bailing out. He acknowledged that he owed money, and said he had fled because Dubai “drives people to make horrible decisions.” He promised to pay back creditors. Jaubert, the ex-French spy, said he fled because he feared getting stuck in Dubai’s penal twilight zone. A keen amateur marksman, he was first called in for questioning in 2007 after bullets were found at his submarine company offices. Interrogators told him that someone had been shot in the head and that he might be involved. Jaubert replied that he didn’t have a gun: his rifle, which he had declared at Customs, was still stuck at the Dubai airport. His bullets got through. Jaubert blamed his woes on pressure on Dubai World to rein in some of the wilder investment projects launched by Sultan Ahmed bin Sulayem, the company’s chairman, who had first invited Jaubert to Dubai. “It was a palace struggle over money,” Jaubert said. Reached on his cellphone, Sulayem declined to comment. Dubai World’s internal audit chief, Abdul Qadar Obaid Ali, said Jaubert and his submarine venture ran into trouble for other reasons: His submarines didn’t work, and auditors uncovered evidence of fraud involving overbilling for equipment purchases. Jaubert denied this, saying all the transactions were approved and paid for by Dubai World managers. Fired from Exomos, the submarine company, and unable to get his passport back, Jaubert hatched an elaborate escape plan. He sent his wife and their two boys to Florida. He had diving equipment shipped out from France — broken down into small bits to avoid arousing suspicion. Then, using a phony name, he bought a Zodiac dinghy and sailboat. Using Google Earth, he surveyed the UAE coastline for an escape route. He found an isolated beach and arranged for a friend to take the sailboat out into international waters. On the eve of his escape, the former spy checked into a hotel near the beach, put on his diving equipment and donned a long abaya, the body-covering cloak worn by strictly observant Muslim women. He said he then went down the beach and swam underwater to a nearby harbor, where the only patrol boat in the vicinity was moored. He clambered aboard and sabotaged the fuel line to make sure the craft could not give chase, he said. A former French special agent who worked for Dubai World has spoken of his anger at being convicted in absence of defrauding the company out of millions of dirhams – a charge he strongly denies. Herve Jaubert told Arabian Business of a carefully planned escape from Dubai aboard a rubber dingy and dressed in a burqa to evade police using skills he developed as a spy. The former French naval officer, who is now living in the United States, said he is not worried about being tracked down to face his five-year prison sentence because he can prove his innocence. One way he hopes to be able to do this is through his book outlining the story of his escape, which is due to be published in October. Jaubert told Arabian Business he decided to flee the country last year after his passport was confiscated by police and he was fired by Dubai World. Meanwhile he was planning his escape. Jaubert sent his wife and children back to Florida where they had all been living before moving to Dubai in 2004, and once they were gone he went into hiding. “Once I was alone in Dubai then I turned to what I used to do before as an intelligence officer. “A friend would rent a room for me in a hotel with his passport so my details would never show up. I would stay in the hotel for three days and then change. Jaubert left from a beach in Fujairah early one morning after sabotaging the only coast guard boat in the area to make sure no one could follow him. He spent six hours aboard the rubber dingy before meeting his friend, who had sailed his boat into international waters, and the pair headed to India on a journey that took eight days. “I’m a naval officer, so at that point I knew what I was doing,” he said. “When I was a secret agent I was a ghost, but here it was different, I was not a ghost anymore. I decided to disguise myself as a woman and then I became a ghost. “When you are covered from head-to-toe in an abaya and veil nobody talks to you, nobody looks at you. Wearing the abaya nobody bothered me, it’s like I never existed. Jaubert was sentenced to five years in jail and fined AED14m by Dubai Criminal Court at a hearing in June at which he was not present. The court was told that Jaubert’s company, Seahorse Submarines, had bought equipment worth AED11.8m for Exomos, the submarine division of Dubai World, but that it did not all arrive. Jaubert had a contract with Dubai World to build two submarines, but prosecutors told the court that when the vessels were delivered they were incomplete and faulty. He wrote to Dubai World and agreed to settle the matter by paying an initial AED3m, but he fled the country before handing over any money. “My book is going to come out and people are going to know the true story and then I will put it behind me,” Jaubert said. He is even confident that readers in Dubai will be able to get a copy. “There’s no way this book is going to be available in Dubai in the open, but I’ve found a way. There will be some tricks, if you want. The book will be disguised. If you order the book you might receive a book on flowers or furniture, but it’s just a cover,” he said. A letter presented to the Dubai Court of Appeal yesterday established that developer Nakheel is a public joint stock company (PJSC), not a private one. The letter was produced by a lawyer representing Nakheel in the case of two former employees who are appealing against their convictions for bribery. The defendants’ lawyer, Saeed Al Gelani, had said in an earlier session that a ruling by Court of First Instance that Nakheel was a public shareholding company was not true to facts. He referred to an article by Nakheel’s legal advisor, David Nicholson, that appeared in Arroaya magazine, which is published by the developer. 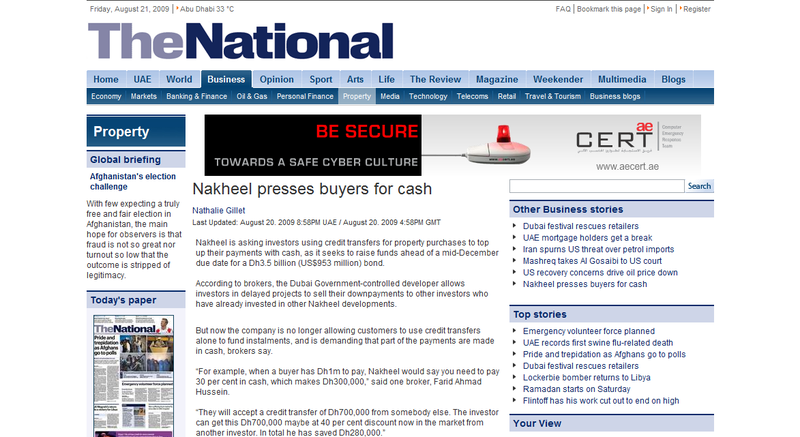 The article said Nakheel had become a private company and was published before the defendants were sent for trial. As a result, said Al Gelani, the two had been tried wrongly. The accused are 32-year-old UAE national WA, a former general manager of sales at Nakheel, and Egyptian KN, 28, who was a sales representative at Nakheel. Prosecutors say they allegedly asked for a bribe of Dh5.1 million from a real estate brokerage firm to help it buy a plot owned by Nakheel. 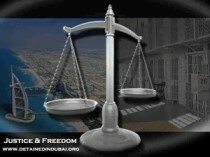 Dubai Criminal Court jailed the defendants for three years and ordered them to pay Dh3m. The court is considering a third appeal by Public Prosecution. 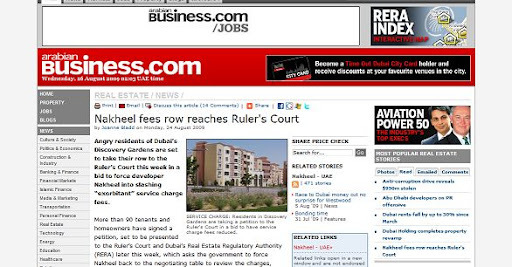 DUBAI // Rashmey Seth paid Dh3.2 million for two luxury flats, furnished them and rented them out. That was nearly two years ago – but she is still not sure she actually owns the properties. Receipts from Nakheel confirm that she paid the state-backed developer in full for a three-bedroom flat on the Palm Jumeirah. Mrs Seth has similar paperwork for a one-bedroom unit in downtown Burj Dubai, purchased last year from Emaar, the Middle East’s largest developer. What she has not received from either of the property giants are title deeds – the crucial documents that verify ownership. It is a predicament shared by many, their status as lawful owners in limbo because of the absence of a piece of paper that, after properties are registered with the Dubai Land Department, should be handed to buyers. 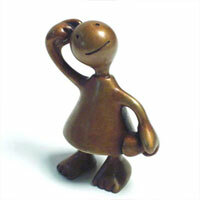 The issue, says Mrs Seth, makes her wonder whether she has a legal right to sell her flats. She is by no means the only property owner in Dubai worried about not having deeds to the flats she has paid for. Without deeds, it is unclear what would happen if the company they bought their property from went bankrupt. There could also be problems with selling the property on: potential buyers could find it difficult to get a mortgage without formal proof of ownership. In Mrs Seth’s case, her dilemma has shaken her confidence in Dubai’s freehold property laws, introduced three years ago to give foreigners the right of ownership. “Why am I not getting the comfort that there’s a legal structure to support me, that makes me feel sure that I really own my property?” said Mrs Seth, 52, an Indian who has lived and worked in Dubai for 28 years. Her fears are not unfounded. Law Number 7 of 2006 states that until flats are registered with the Land Department, which will then grant title deeds, buyers lack the rights of fully fledged owners. In an email statement, Emaar did not specify how many of its property holders had not had units registered or lacked deeds. Nakheel said the “majority of … purchasers who have taken handover have received their title deeds”. Given the size of Nakheel’s development portfolio, that could still mean thousands have not received them. There are indications that a substantial number of buyers across Dubai lack deeds. After posting a query on Crest of Dubai, a website used by residents of the Palm Jumeirah, The National received nearly two dozen complaints. And Michael Aldendorff, a 39-year-old South African who is one of the leaders of an informal homeowners’ group in the Discovery Gardens development, reckoned that most buyers in the 26,000-apartment community lacked deeds. “I don’t think that many people here have them at all,” he said. That, however, has not stopped developers from asking purchasers to pay to get their deeds. Mrs Seth said she was asked to hand over about Dh55,000 for flat-registration fees to Emaar and Nakheel. She said she had little choice but to comply; according to Land Department regulations, a buyer cannot register a property without the developer’s consent. “They take these undated cheques from you, and they bank it at their will, so what can you do about it?” she said of Emaar and Nakheel. Sabri Pozem, who owns a one-bedroom flat in Discovery Gardens, in which he has a tenant, wonders whether the authorities – or anyone apart from himself – have records of his purchase. Mr Pozem, a 29-year-old from Turkey, is one of the owners in the development who complain about disorganisation among Tamweel, the mortgage lender, Nakheel, the master developer, and property companies which, after purchasing Discovery Gardens apartment buildings from Nakheel, have sold them as flats to individual buyers. He said a salesperson with the company he bought his flat from entered the property last month and began showing it off to a prospective buyer. His tenant had just come out the shower and was wearing only a towel when she encountered the surprise visitors. “The problem is, they are so disorganised they don’t even know who bought which apartment in the building,” said Mr Pozem, who said he had tried many times to obtain his deed and has had no success. Mr Pozem is not the only owner worried that without deeds they might not be able to sell their units. Anne, 37, a British national, bought two one-bedroom flats in the Dubai Marina’s Marina Promenade in August last year and two more in Green Lakes Towers in Jumeirah Lake Towers. Despite investing nearly Dh4m, she does not have a deed for any of them. Anne, who asked that only her middle name be published, said her main concern was that banks would refuse a mortgage to prospective purchasers without a deed, an increasingly common requirement after the credit crunch. She also said Emaar, the developer of Marina Promenade, and Asam Investment & Real Estate, the Green Lakes Towers developer, had been little help. A senior administrator at Asam Investment & Real Estate, who gave his name only as Abraham, told The National that a backlog at the Land Department was responsible for the delay. In Green Lakes Towers, he said, about 700 units in the three towers were still waiting to be registered. “We cannot do them individually; we have to register the whole tower together,” he said. He added that he hoped the process could be completed within a month. Humaid al Shamsi, the head of the transactions section at the Land Department, acknowledged the issue. Eighty per cent of the buildings on the Palm Jumeirah have been registered, he said, but he did not have details of how many flats had been registered or title deeds granted. At Jumeirah Lake Towers, he said, “the process has been started now.” He attributed any delay to “extra measurements” being done to the buildings. However, Karim Nassif, a property lawyer at Habib al Mulla & Co, said the slowdown in the property market meant a logjam at the Land Department was an unlikely cause for the problem. In most cases of undelivered title deeds, he said, “the developer should be held liable – 100 per cent – for it. They should be delivering their title deeds”. Malika Karoum, a senior executive of Dubai’s real estate sector yesterday accused her former husband of spreading rumours about her being convicted by an Egyptian court on charges of money laundering and involvement in arms trading. Malika Karoum told Emirates Business the claims were made in a Dutch tabloid magazine to damage her reputation, career and life. “This whole story has been created by my ex-husband and his private detective,” she said. “I was shocked to see my picture on the front page of your paper. I am Malika Karoum and I have been living and working in Dubai for the past three years. “I have no problem with any authorities or police. Call any of my ex-employees and check with them. The only correct thing in this article is that I have worked for Omniyat, Define and ACI. While Australians languished in Dubai jails, a much bigger fish made fraudulent millions with impunity. This glamorous but treacherous spy is finally behind bars, writes Rick Feneley. They call her the modern-day Mata Hari, a spy-turned-criminal who laundered fortunes from drug runners and arms dealers through Dubai’s high-rise wonderland. Alternatively, they have cast Malika Karoum as an innocent woman, a fugitive not from the law but from an abusive husband who maliciously defamed her – and concocted the whole spy-crime thriller – as part of a bitter custody battle for their young son. Only now could it reveal that Karoum had been in jail for the past six months in Egypt, where the Ismailiya State Security Court convicted her in April of money laundering and involvement in weapons trading, but acquitted her of espionage. Karoum, who had also performed intelligence work for Egypt, had been sentenced to 28 months in prison, and the Court of Appeal had upheld the decision last month. More sensational, though, is the news of how Karoum was caught. In a top-secret operation, her former colleagues from the Dutch secret service arrived at her Dubai apartment at 2am on January 21. They held her there for several weeks under house arrest before taking her to Egypt, an intelligence source has told Revu’s reporter Jan Libbenga. Dubai has no extradition treaty with the Netherlands. The Dutch, in effect, abducted Karoum only after negotiations with her lawyers, to bring her back to Amsterdam, broke down. Four days after the swoop on Karoum’s home, Dubai police arrested two Australians, Matt Joyce and Marcus Lee, on suspicion of fraud. The pair are former executives of Dubai Waterfront, the world’s grandest waterfront project, a subsidiary of the Emirate’s biggest property developer, the government-owned Nakheel. The jailed Australians, who are fighting to prove their innocence, are in no way linked to Karoum. Karoum – using her apparent cover as a real estate executive – did do some work on property developments within Dubai Waterfront, among other sites. She was accused of funnelling drug and arms money – including that of an Egyptian weapons dealer – into Dubai’s property bubble, which burst spectacularly last year. Millions invested through her by criminal networks are said to have vanished. While Joyce and Lee and other Australians languish in Dubai’s jails, the Karoum story throws light on the way business is done in the Emirate. The sheikhdom is making a big show of cleaning up corruption in its property industry, but it showed no apparent interest in stopping Karoum. Indeed, Libbenga says, she ended up spying for the United Arab Emirates, too, and it offered her protection. She had also spied for Egypt. Her old Dutch colleagues could well understand the analogy with the original Mata Hari, the Dutch exotic dancer Margaretha Geertruida Zelle, a seductress who became a double agent during World War I, working for both French and German spymasters. Karoum joined the Dutch secret service in 2004, Revu says. Most of her work had concerned secret investigations of Islamic organisations in the Netherlands suspected of terrorist aid. She was sent to Dubai late in 2006 to investigate terrorist financing and money laundering to and from Dubai. Once there, she soon defected to her own cause: making money. For her Dutch spymasters, the alarm rang in October 2007, when a Dutch-Turkish money courier was arrested at Schiphol Airport, Amsterdam, with more than €100,000. He said it was to be collected by Karoum. This man was not known to her spy colleagues. The secret service contacted police. It transpired that observation teams from the Bureau of National Research had photographs of a woman in the company of Dutch drug dealers. Only then did they realise it was Karoum. Now authorities suspect Karoum played an important role in drug trafficking, Revu reported. Karoum had managed to slip back into the Netherlands at the time of the man’s arrest, but she escaped via Madrid and Casablanca to Dubai. She left her hire car behind, with a note to the hire company, in a garage in the town of Breukelen. Diplomatic pressure on Dubai failed to have her returned to the Netherlands. The Herald began trying to find Karoum in early February this year. As late as April our calls were being transferred to her extension at ACI Real Estate in Dubai, the subsidiary of a German-based company. Like many caught in the Arab Emirate’s collapsing real estate market, ACI is struggling to complete grand visions such as its Sports Trilogy: the Niki Lauda Twin Towers, the Boris Becker Business Tower and Michael Schumacher Business Avenue. ACI’s switch repeatedly told the Herald that Karoum was, indeed, still working there. But messages went unanswered, as did emails to Karoum’s address with the firm, requesting a detailed response to the many allegations against her. Now we know why. Also in February, Political News of Morocco editorialised that Karoum was giving its emigrants a bad name and asked why Dubai was doing nothing about her. Now we know that the Dutch secret service already had. In a webcast by Panorama Magazine late last year, Karoum said the whole story against her was a lie, created by her former husband Mohammed Boulnouar. She said she had fled the Netherlands because he had mentally and physically abused her. Jacques Smits, an Amsterdam private investigator and former policeman, has been on Karoum’s trail since January last year. He was originally employed by Boulnouar to hunt her down in Dubai and retrieve their son, Mohammed jnr, now aged about eight. In February last year Smits flew to Dubai, hoping to confront Karoum. He had already intervened and warned her then employer, the Dubai property firm Omniyat, about Karoum. The company went on to sack Karoum and her boss for alleged fraud. He believes she is capable of it, and this motivated his campaign to bring her to justice, long after he stopped working for her husband. A Dutch court later ordered Karoum to return her son to the Netherlands, then overturned that ruling last December. Either way, Smits is no friend of Boulnouar, who had been a travel agent in West Amsterdam. He says Boulnouar paid him only €7000 ($12,000) and still owes him €10,000. Smits says he helped Dutch intelligence to keep pursuing Karoum. Last November customers accused Boulnouar of stealing the money they had paid him for the haj to Mecca. He had claimed he was the victim of a robbery on October 31 when he tried to deliver about €300,000 in cash and several hundred passports to Royal Jordanian Airways. He claimed the robbers told him they were sent by ”Malika”. Smits does not buy his story. Nor does he buy Karoum’s. In January last year Smits received a tip that she was returning to the Netherlands for a wedding. He says he went to Schiphol Airport and, armed with photographs, alerted a Dutch military police officer. The officer had called up Karoum’s Interpol file, then left the room briefly to get the print-out of the document. Smits says he was able to read the warrant on the screen. ”There were six or seven felonies.” They included money laundering and drug offences. Dutch police observation teams had seen a woman in the company of a British man, Simon John ”Slapper” Cowmeadow. Only later did they realise she was Karoum. Cowmeadow was shot dead in an Amsterdam street on November 18, 2007. Nadim Imac, a suspected heroin importer and the sponsor of a Dutch soccer team, Turkiyemspor, was thrown to his death from a moving bus on February 17 this year. Police found €223,000 in his home. A player from his soccer team had acted as a money courier to Dubai, where money from a Turk associate of Imac’s was invested in Damac Properties. Karoum had handled that introduction. Revu has reported on Karoum’s connections with the Dutch company Palm Invest, which has come under the spotlight for alleged fraud. Karoum’s old boss at Omniyat took her with him in June last year when he launched Define Properties in Dubai. Define had 12 lots on Nakheel’s Waterfront site, and relied heavily for funds on a key Karoum contact, an Egyptian arms dealer. But when stories began circulating about Karoum, the boss sacked her. Later, Define could not raise enough capital and ACI Real Estate took over some of its properties. It first employed the Define boss, but dumped him after recruiting Karoum. ACI has not responded to the Herald’s questions. From last December Karoum’s lawyers advised her to co-operate with Dutch authorities. Revu reported she was offered an ”ample golden handshake” from the secret service and an opportunity to start a new life in a third country. Los Angeles, Singapore, Luxembourg, Malta, Egypt and the Dutch Antilles were destinations recommended. The Dutch, more than anything, wanted to stop her giving intelligence to other countries, and to stop her criminal pursuits. Karoum had seemed agreeable but withdrew at the last moment. She reportedly believed she would be afforded the protection of sheikhs in Dubai. That came to nothing at 2am on January 21. In most countries the snatching of Karoum – a breach of sovereignty – would have caused a diplomatic crisis. But there has not been a peep out of Dubai, which does not care about bad publicity. The Dutch Ministry of Foreign Affairs said it could not answer any of the Herald’s questions, on privacy grounds. The names of even convicted criminals are protected in the Netherlands. Jan Libbenga will publish a book, The Hunt for Malika, Modern Mata Hari, in October. Jacques Smits says an estimated €19 million is still missing from Karoum’s crimes and the Dutch secret service may recruit him to help retrieve it.